Our Awakening: The Skyward Castle Walkthrough takes you through this charming final installment of the quest of young Princess Sophia, who has awakened from a magical century-long slumber into a land threatened by an ancient evil. Join Sophia as she braves untold dangers to find her exiled kingdom and save her people. Use this Skyward Castle walkthrough whenever you need a helping hand or as a constant companion through your journey. Thanks for joining us at the Awakening: The Skyward Castle Walkthrough. Here you'll discover everything you need to complete this enchanting hidden object adventure game. This Skyward Castle walkthrough includes custom screenshots with all the items and locations marked for you, as well as detailed instructions on how to beat each and every section of the game. We hope you enjoy this exciting hidden object game! Awakening: The Skyward Castle is the culmination of the Awakening story, as we join Princess Sophia on her final leg of her journey. Picking up where the last Awakening game left off, Princess Sophia finds herself hurled into danger as an unnatural storm disrupts her travel and forces her to go the rest of her journey on foot. Can you help Princess Sophia make her way to the Skyward Castle and save her people? Armed with this walkthrough, it will be a walk in the park. Journal - The journal is in the bottom left hand corner of your screen and will store and hints and helpful notes that you find along the way. It's a good idea to click on the journal and look over everything if you're stuck. Inventory - Your inventory can be found in the bottom of your screen. Any items that you find will be automatically placed in your inventory. Hints - Your loyal friend Ran the owl is here to help you if you get stuck and don't know what to do next. Click on him if you're stuck and need some help. Skip - During mini-games, if you are having trouble or maybe you just don't feel like solving it, you can click on the skip button located at the bottom of your screen. Difficulty Settings - There are three difficulty settings in this game, relaxed, normal, and dreadmyre! Hand Cursor - When your cursor turns into a hand, it means you can pick up an item or interact with an object in some way. Magnifying Glass Icon - When your cursor turns into a magnifying glass, it means you can zoom in or interact with an object or person. Map - Once you've unlocked an area, you can fast travel to it by clicking on your map in the lower right hand corner of your screen and clicking on the place you would like to go. Pocket Scroll - If you need extra guidance on what to do, click on the question mark on the left for a clue on what you're supposed to be doing. Hidden Object Scenes - Sparkling areas will indicate a hidden object scene. Click to start it. 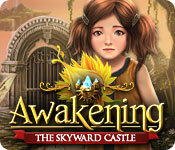 We hope you enjoy our Awakening: The Skyward Castle Walkthrough!